The Aldens spend the summer on Grandfather's island! 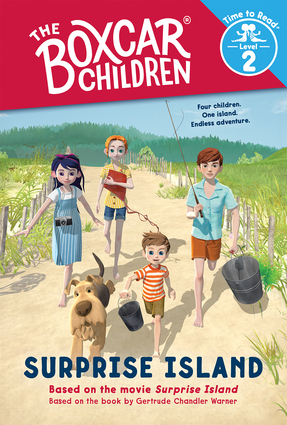 Joe, the island's friendly handyman, helps them with anything they need, but as the children continue to explore their summer home, they realize there is more to the island—and to their new friend—than meets the eye. Adapted from the feature film of the same name, this early reader allows children to step into reading with a Boxcar Children classic. Gertrude Chandler Warner grew up in Putnam, Connecticut. She wrote The Boxcar Children and when readers asked for more adventures, Warner wrote more books—a total of 19 in all. After her death, other authors have continued to write stories about Henry, Jessie, Violet, and Benny Alden, and today the Boxcar Children series includes more than 100 installments. Largely self-taught, Shane Clester has been a professional illustrator since 2005. He began working in comics and storyboards before transitioning to children's books. He lives in Florida with his wife and two children.